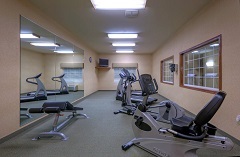 With thoughtful amenities like free high-speed Internet access, you and your family can enjoy a comfortable stay at the Country Inn & Suites, Winchester, VA. Start your day with a dip in our heated indoor pool, or head to the fitness center for a refreshing workout. Corporate travelers can finish up projects at the 24-hour business center, and on-site laundry facilities give parents a jump-start on vacation laundry. Make your first meal of the day more enjoyable with a stop at our free, hot breakfast. You can fill up on waffles and eggs or opt for a rotating selection of delicious hot items. For matinees with a late lunch or snacks at the evening show, head next door to the Alamo Drafthouse Cinema. Our hotel is also within easy reach of nearby restaurants like Village Square and Neighborhood Italian Kitchen.